San Francisco condominium sales are currently 8 percent lower year to date compared with the same time period last year, although August sales are on par with 2015 numbers. The annual decline follows some of the strongest historic years for condominium sales in the city. While sales in most price segments have slowed this year, the weakness is most notable among units priced between $2 and $3 million. That is a small share of the market — about 6 percent. Other market indicators — including price growth, the share of homes selling over the asking price, premium over asking price, and time on market — all suggest normalizing market conditions. Combined citywide new construction and resale prices are up 4 percent, however The Mark Company’s August Condominium Pricing Index for San Francisco was down 5 percent from July and 11 percent from August of last year. 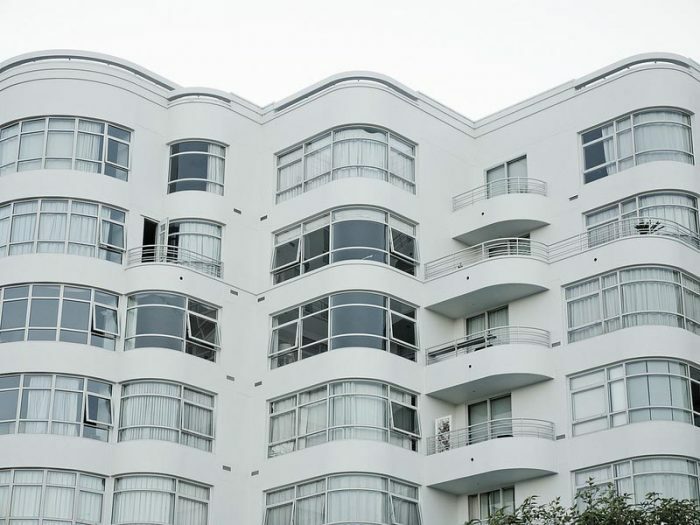 Increased inventories of similar new condominiums, along with concerns over volatility in the financial and technology markets in part explain changes in the Index. Despite the recent spike in new construction inventory, future inventory will be constrained and remain well below the historical peak reach in 2007. Short term, slower price growth and more inventory to choose from, along with continued favorable interest rates, put buyers in a better position to shop around. On the heels of some of the strongest years in history for San Francisco’s housing market, much of the discussion since the beginning of the year has been about slowing conditions. Slowing, however, is relative when compared with the frenzied and unsustainable market that we have seen over the last several years. Similar to single-family home sales, there have been fewer condominium sales in 2016 in San Francisco when compared with the same time period last year. For the first eight months of this year, total sales are 8 percent lower than for the same period last year. Nevertheless, there is more to the story. 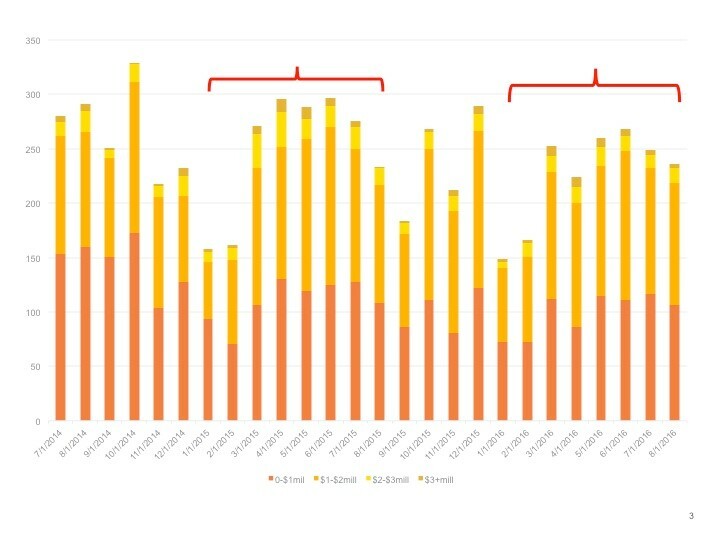 Figure 1 displays monthly sales of condominium units in San Francisco, with the red brackets comparing January through August of 2015 with the same period for 2016. While this year started off on par with 2015, spring and summer months suggested that the market is taking a breather. 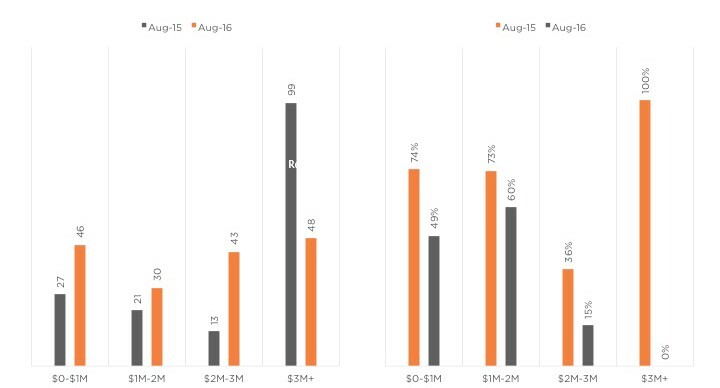 August sales, however, are in line with August 2015 sales, indicating that we may still see some improvement in the remainder of the year. Editor’s Note: The following analysis uses data from the San Francisco MLS, which historically includes about 15 percent of newly constructed condominiums. A look at longer-term trends helps put the current market into perspective. Figure 2 illustrates historical monthly sales of condominiums in San Francisco. While the total 1,042 sales in the first two quarters of 2016 have fallen from the 2013 cyclical peak of about 1,265 for the same period, this year’s sales are still above the historical average of 1,021. Certainly, they are at least 30 percent higher than averages seen during the 1990s or the housing market collapse between 2008 and 2010. Additionally, the buildup to the sales peak reached in 2013 followed the 2008-2009 housing collapse and resulting sizable inventories of homes for sale and historically high affordability in San Francisco. In 2012, San Francisco reached the highest affordably point for all types of homes since the California Association of Realtors started tracking the data in 1991, at 29 percent. The only other time when homes were relatively more affordable in San Francisco was at the beginning of the 1990s, when affordability hovered in the mid-20-percentile range. Since peaking in 2012, affordability has dropped to 10 percent today. 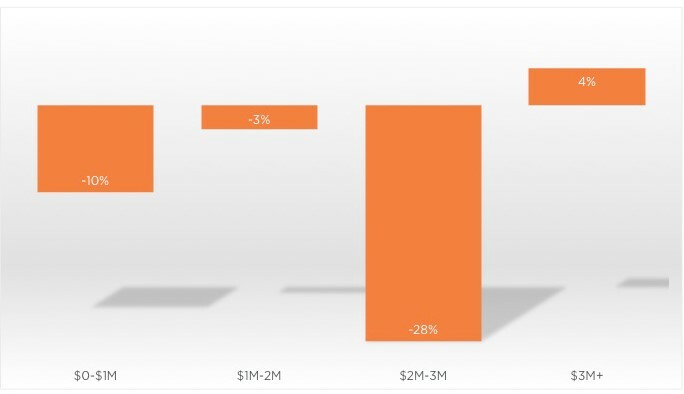 Returning to current trends, Figure 3 illustrates that while overall condominium sales in San Francisco are 8 percent lower year to date, the largest decrease in transactions was for units priced between $2 and $3 million, with volume falling by 28 percent from the same period last year. Sales at the lowest price segment — less than $1 million — were 10 percent lower, but the decrease was largely driven by price appreciation that pushed part of the inventory into a higher price range. Sales of units priced between $1 and $2 million were down only 3 percent, which translates to 25 fewer units. The highest-priced segment, $3 million and higher, saw a 4 percent increase in activity, with two more units sold year to date. Overall, about 152 fewer units were sold so far in 2016 when compared with 2015. Nevertheless, when reconciling the changes in sales activity by different price categories, it is critical to understand how the distribution of price ranges compare with one another. Though impacted the most, homes priced above $2 million comprise less than 10 percent of overall sales. 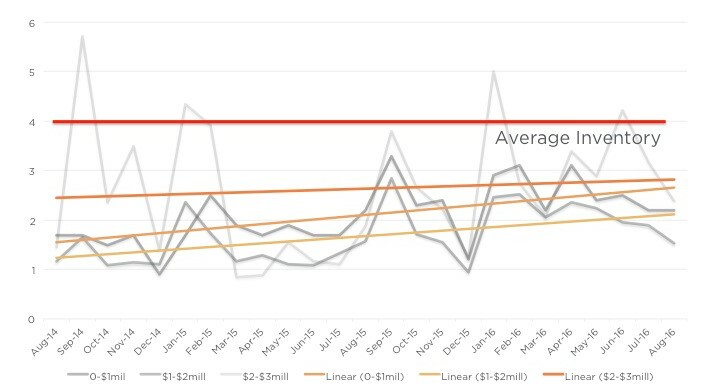 Figure 4 depicts the distribution of sales by price range and highlights that sales over $2 million passed 10 percent only during the first two quarters of 2015. Prior to 2014, they accounted for a much smaller share of the market. What is also interesting to note is the dwindling share of the lowest-priced condominiums, less than $1 million. Their share of the market fell from 68 percent in 2013 to 42 percent of sales currently. The dominant category is condominiums priced between $1 and $2 million, which has grown notably from 30 percent three years ago to 50 percent today. Though rapidly rising prices are in part due to the falling share of the most affordable condominiums, Figure 5 takes a longer look at the distribution of sales among price ranges for newly constructed condominiums. Until 2013, the majority of newly constructed condominiums were in fact priced below $1 million. The turning point began in 2013, when affordable condominiums fell from accounting for eight in 10 new sales to only one in 10 sales today. Again, the majority of the new inventory today consists of condominiums priced between $1 million and $2 million. In addition, higher-end condos, priced at $2 million to $3 million, now comprise 10 percent of the market, which is historically the highest share they have ever reached. Unfortunately, (see Figure 3 above), that appears to be the segment of the market that has been hit the hardest this year. Nevertheless, Figure 5 clearly highlights how the change in price distribution for newly built condominiums has adversely impacted affordability in the city. 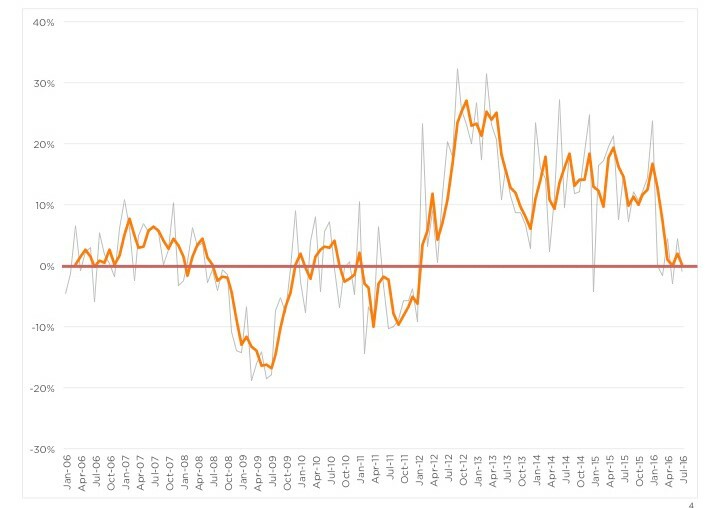 Other indicators also confirm that the homebuying frenzy that characterized the market over the last few years is normalizing. Figures 6 and 7 compare market conditions among the various price ranges between August of this year and August 2015. And although homes are selling slower at all but the highest price range, the relative increase in the number of days on the market was the highest for condominiums priced between $2 and $3 million. For all condominiums, the median days on market is now 38 days, which is consistent with historical average dating back to 2002 according to CAR data. Also, there was a notable drop in the share of listings selling above list price at all price ranges (Figure 7). The segment priced between $2 and $3 million fell from 36 percent of units sold for a premium to 15 percent. Lower-priced segments also experienced notable drops. Still, at least half of sales priced below $2 million continue to sell for more than asking price. Among the most expensive condos, none sold above their asking prices. Again, the most expensive price point represents a very small share of the market, so caution should be used when evaluating the numbers. Furthermore, diminished competition among buyers is leading to smaller premiums. 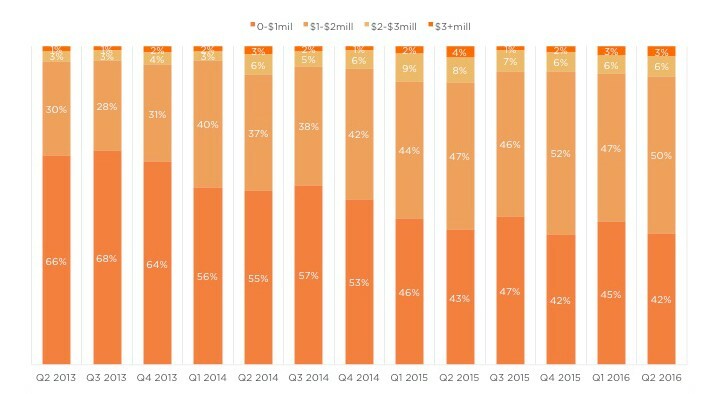 Within each price segment, the premium fell to about half of what it was last year. The premium over asking price averaged 8 percent this August, down from 13 percent last August. Finally, annual price growth cooled this summer after several years of double-digit-percent appreciation. The slowdown began abruptly in February, when annual appreciation dropped from 18 percent year over year to flat. Since February, appreciation rates have picked up — albeit inconsistently — and August prices were 4 percent higher than last August, with the median price at $1,085,000. Again, it’s important to keep in mind that lower annual price appreciation comes on the coattails of highly aggressive market conditions and home price growth that was unsustainable. According to The Mark Company’s August Trend Sheet, the Condominium Pricing Index for San Francisco declined by 5 percent from July and 11 percent from August of last year. The Condominium Pricing Index is The Mark Company’s tool for tracking the value of a new construction condominium without the volatility of inventory changes. The Index uses a proprietary quantitative method to model the price per square foot of a new 10th floor, 1,000 SF condominium. The decline in the Index can be attributed in part to three major factors. First, while new construction inventory is still low by historical trends and well below the peak of over 3,000 units reached in 2007, new construction inventory nearly doubled between the end of 2015 and August 2016. The sharp increase from 569 units to 1,101 units will impact pricing. Second, newly constructed condominium projects, particularly at the higher end, have been impacted by concerns over volatility in the financial and tech industries. And lastly, sales in the South of Market neighborhood have been somewhat affected by recent news surrounding Millennium Tower. Notably, the majority of the product type reflected in the Index is located in the city’s South of Market neighborhood, which also explains the drop compared to citywide numbers, which are more diverse. Still, despite the cooling of last summer’s frenzy, demand for condominiums in the city remains consistently strong, as evidenced by minimal changes in the absorption rates. Across all price ranges, and even for newly constructed inventory tracked by The Mark Company, absorption rates in August were generally on par with last August. Approximately 315 new construction units were put into contract since the spring of 2016. What should we expect from the San Francisco condo market going forward? After a long period of very tight inventory, recent trends suggest that some relief is in sight. Also, with new construction ramping up over the last year across the city, newly constructed condominiums will supplement existing inventory. Figure 9 tracks the unsold inventory index across price ranges for homes listed on the MLS. And while it appears that inventories of existing condominiums are rising across the price spectrum, at about a 2 to 2.5 months’ supply of inventory, there is still a long way to go before San Francisco reaches its historic average of a 3.9-month supply. Inventory of new units remains historically low, and there are just 1,101 new units available for sale today, compared with approximately 3,000 units available in 2007. Looking forward, only 672 new units are expected to enter the market by the end of 2017. This marks a 48 percent decrease from the number of units that have entered or are expected to enter the market in 2016 and a 7 percent decrease from the number that entered in 2015. 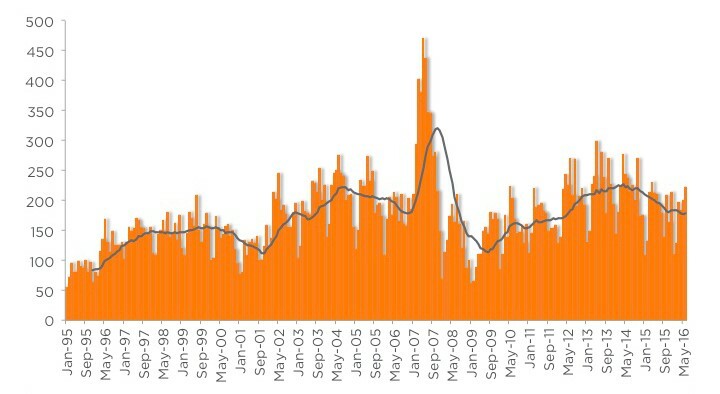 During the previous cycle, 1,519 units began selling in 2006, and an additional 1,591 were added in 2007. In addition, future inventory in upcoming developments consists of predominantly small, neighborhood projects where the average size of developments is less than 100 units. Currently, 450 units are under construction and not yet selling in the South of Market neighborhood. What does this mean for condominium buyers in San Francisco? More predictable prices, normalization of market conditions, historically favorable mortgage rates, and more housing options for buyers to choose from. That comes as a welcome break in a city where the housing-affordability crisis has become nearly synonymous with its name. The Mark Company is one of the nation’s premier urban residential marketing and sales firms. We provide a full range of core consulting services including analytics, design, marketing and sales for urban high-rises and suburban attached properties throughout the Western United States. The Mark Company has represented more than 10,000 residences and generated over $5 billion in sales for some of the nation’s most notable and successful new construction developments. The Mark Company is a subsidiary of Pacific Union International, one of the San Francisco Bay Area’s top-performing resale brokerages. For more information about our services and to download our latest Trend Sheets, please visit www.themarkcompany.com.